Basil of Caesarea is considered one of the architects of the Pro-Nicene Trinitarian doctrine adopted at the Council of Constantinople in 381, which eastern and western Christians to this day profess as ""orthodox."" Nowhere is his Trinitarian theology more clearly expressed than in his first major doctrinal work, Against Eunomius, finished in 364 or 365 CE. 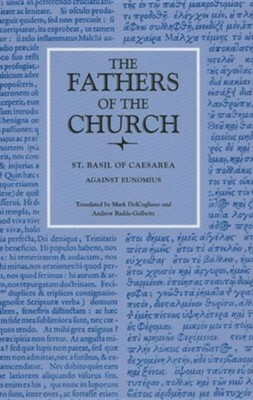 Responding to Eunomius, whose Apology gave renewed impetus to a tradition of starkly subordinationist Trinitarian theology that would survive for decades, Basil's Against Eunomius reflects the intense controversy raging at that time among Christians across the Mediterranean world over who God is. In this treatise, Basil attempts to articulate a theology both of God's unitary essence and of the distinctive features that characterize the Father, Son, and Holy Spirit--a distinction that some hail as the cornerstone of ""Cappadocian"" theology. In Against Eunomius, we see the clash not simply of two dogmatic positions on the doctrine of the Trinity, but of two fundamentally opposed theological methods. Basil's treatise is as much about how theology ought to be done and what human beings can and cannot know about God as it is about the exposition of Trinitarian doctrine. Thus Against Eunomius marks a turning point in the Trinitarian debates of the fourth century, for the first time addressing the methodological and epistemological differences that gave rise to theological differences. Amidst the polemical vitriol of Against Eunomius is a call to epistemological humility on the part of the theologian, a call to recognize the limitations of even the best theology. While Basil refined his theology through the course of his career, Against Eunomius remains a testament to his early theological development and a privileged window into the Trinitarian controversies of the mid-fourth century. I'm the author/artist and I want to review Against Eunomius.